Judy Naidoo on set with young actors Shaan Nathoo and Aaqil Hoosen. 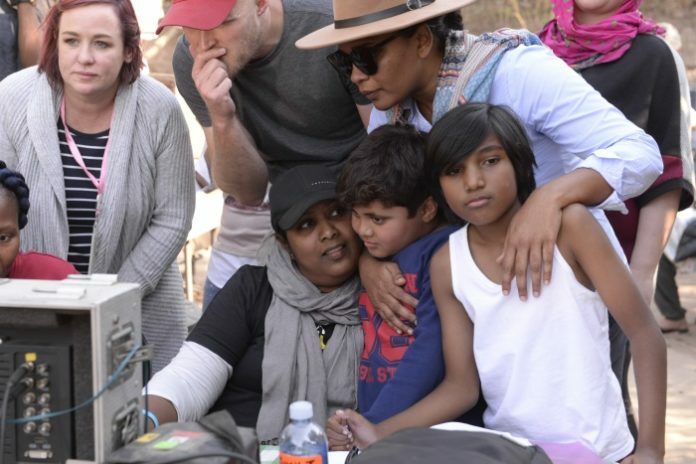 South African director and producer, Judith Naidoo tells the story of historical towns of Verulam and Tongaat, in her new movie, kings of Mulberry street. The towns are just north of Durban, and were developed largely by Indian indentured labourers. Together, under the fictionalised name of Sugarhill District, they provide the colourful setting for Kings of Mulberry Street, the new feature film written and directed by acclaimed director and producer Judy Naidoo. Set in the early 80s, the film tells the story of two young Indian boys who have to find a way to overcome their differences and unite in order to defeat the bullying local crime lord who’s threatening their families. The film brings together the rich and colourful world of the Indian community in the 80s as well as Bollywood cinema and songs from that era, in a tale. Naidoo is a multi-award-winning filmmaker who had great success on the local and international film festival circuit when her debut feature Hatchet Hour (2016) scooped several prestigious awards, including Best Director and Best Picture at the New Hope Film Festival in Pennsylvania, as well as the Best Foreign Film Award at the LA Femme International Film Festival. The film was also selected in competition at many other international film festivals. Kings of Mulberry Street stars Aaqil Hoosen (12) as Ticky Chetty, and Shaan Nathoo (9) as Baboo Harold Singh in the lead roles. Rounding out the cast are Thiru Naidoo, Rizelle Januk, Amith Sing, Neville Pillay, Keshan Chetty, Hamish Kyd, Kimberly Arthur and Chris Forrest. In the role of Granny Chetty is audience favourite Kogie Naidoo, known for her role as Amsugi in the Broken Promises franchise. Kings of Mulberry Street will be distributed in South Africa by Indigenous film Distribution. Kings of Mulberry Street will be in cinemas on 28 June 2019.